Address: Lot 30 Tolmie Street, Bunya Mountains QLD 4405. 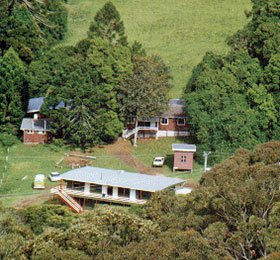 The Presbyterian Camp at Bunya Mountains provides accommodation for church and youth groups, community and school groups. Campers can enjoy spectacular views 1,100 metres up in the fresh mountain air amid 17,000 hectares of National Park rainforest, grassland and open forest featuring our very own majestic Bunya Pine. The facilities have undergone extensive renovations with a large desk overlooking the campsite, a new kitchen and an improved layout of dormitories. Camp Bunya Mountains accommodates There are 60 beds in total in the form of double deck bunks. The front dormitory accommodates 20 campers and the back dormitory accommodates 32 campers. The separate Leaders Cabin will accommodate 4. Separate facilities are provided for each dormitory, plus one handicapped unit (which may be used as a leader’s bathroom if required). Self catering. The kitchen is well equipped with gas stove & oven, microwave oven, large commercial fridge, deep freezer, urn, dishwasher, teapots, boilers, baking trays, cooking utensils, crockery and cutlery. We do not provide electrical appliances other than toasters. There is also an outdoor gas barbecue with several tables and seats just outside the kitchen. Please note: Camp Bunya Mountains is self-catering. The setting of the dining area can be left permanently in place for up to 50 people allowing a meeting area for a similar number. This area includes a video player and 65-inch TV capable of supporting PowerPoint, videos and Google TV, whiteboard, lectern, blackboard and notice board fixed to the walls. Public phones are available just a short walk from the Camp Bunya to Dandabah. Campers can be contacted on the Caretaker’s phone for emergency calls only. Fuel is available at Maidenwell, Kumbia or Maclagan, which are all about 30 kilometres away. Sleeping bags/ blankets, pillows, bed sheets, towels and warm clothes. Keep in mind that the nights here can be cool (even in Summer). First Aid Kit (as a spare; addition to what is provided). Insect repellent to discourage ticks. If using the campfire, please bring sufficient firewood and observe safety precautions. Wood is supplied for the pot belly heater in the dining area during the cold months. It is a requirement that all organisations using Camp Bunya Mountains have their own Public Liability Cover. Please forward a copy of your Certificate of Currency with the Booking Form. For groups that do not have church or club insurance coverage, home owner’s insurance has a public liability component. The Presbyterian Camp Bunya and its staff accept no liability or responsibility for any loss or damage to property, or injury of or to any person. See the Camp Bunya Mountains Information Sheet for fees, terms and booking conditions. PO Box 1351, Milton LPO, QLD 4064. In case of cancellation, the booking fee will be refunded if notice is given to the Caretakers earlier than 2 months before the proposed camp, then we may be able to re-book. From Brisbane (North Side) to Bunya Mountains - 221 km. Take the Bruce Highway to Caboolture (44 km) then D'Aguilar Highway through Woodford, Kilcoy, Moore, Blackbutt and Yarraman (122 km). From the centre of Yarraman, turn left towards Cooyar for 20km, before taking the right turn to Bunya Mountains. At Maidenwell (11 km), turn left for the Bunya Mountains (28 km). On this section, there is approx. 6km of reasonable gravel - and a good bitumen road for the gradual climb up the mountain. At the intersection with the Dalby road, turn right. Pass the T.V. towers, then take the next turn left at the "Presbyterian Camp" sign, down Tolmie Street. You will come to the camp just down the hill on your right. Turn in for a relaxing and refreshing break in a beautiful natural environment. From Brisbane (South and West side) to Bunya Mountains - 234 km. via Esk. Take the Warrego Highway past Ipswich, then take the Esk turn-off for the Brisbane Valley Highway, through Esk and Toogoolawah, linking up with the D'Aguilar Highway through Moore and Blackbutt to Yarraman. Follow directions from Yarraman as above. via Warrego Highway through Toowoomba and Jondaryan, Quinalow and Maclagan, as detailed below. From Toowoomba to Bunya Mountains - 108 km. Take Warrego Highway to Jondaryan (44 km). Turn right just before Jondaryan at the sign for Bunya Mountains. Cross the railway line, and follow signs to Quinalow and Maclagan (35km). Turn left at Maclagan store. There is a small section (approx. 4 km) of gravel road before joining Dalby - Bunya Mt. road (17 km). Turn right on bitumen to the Bunya Mountains (12km). After climbing the mountain, pass Munro's Camp, veer left at the Nanango road intersection, pass the T.V. towers, then take the next turn left down to the campsite on your right, the ideal setting for your church youth group, conference, retreat or family group. From Toowoomba to Bunya Mountains - 140 km. The better route for coaches. Take the New England Highway through Crows Nest and Cooyar (94 km). 7 kms past Cooyar take the left fork to Maidenwell (11 km). Turn left at Maidenwell for the Bunya Mountains (28 km). On this section, there is approx. 8 km of reasonable gravel, then a good bitumen road for the gradual climb up the mountain. At the intersection with the Dalby road, turn right. Pass the T.V. towers, then take the next turn left at the "Presbyterian Camp" sign (approx. 2km). You will find the camp just down the hill on your right, ideally situated for schools, biology groups or workshops. On an all bitumen road. Take Bunya Highway out of Dalby towards Kingaroy. On the outskirts of town, turn right at Bunya Mountains sign, and follow this road to Kaimkillenbun. At K'Bun, turn right across the railway line for approx 5 km, then turn left to the Bunya Mountains. The last 10 km section climbs up the mountain. Veer left at the intersection with Nanango road. Pass the T.V. towers, and take the next turn left. The Presbyterian camp is just down the hill on your right - less than an hour's drive to a world apart. All bitumen road via Kumbia. Follow the Bunya Highway towards Dalby. Turn left to the Bunya Mountains approx 5 km past Kumbia. After climbing up the mountain, pass Burton's Well, Cherry Plain and Westcott camping areas. Continue past the turn-off towards Dandabah. Take the next turn right and you will see the campsite just down the hill on your right, the right spot for a restful retreat. From Bundaberg - 314 km. Take the Isis Highway through Childers, Biggenden, Coalstoun Lakes, to Ban Ban Springs, linking to the Burnett Highway (138 km). Turn left down the Burnett Highway for 32 km then turn right to Murgon, Wondai, and Kingaroy (84 km). Follow instructions from Kingaroy as above. From Gympie, Maryborough, Hervey Bay. From the Bruce Highway, take the Wide Bay Highway through Kilkivan to Goomeri (63 km). Turn south down the Burnett Highway to Nanango (60 km). 3 km south of Nanango, turn right taking the Nanango- Cooyar Road, to Maidenwell (24 km), then turn right towards the Bunya Mountains (28 km). On this section, there is approx. 8 km of reasonable gravel - and a good bitumen road for the gradual climb up the mountain. At the intersection with the Dalby road at the top of the mountain, turn right. Pass the T.V. towers, then take the next turn left at the "Presbyterian Camp" sign. The campsite is down the hill on your right, in a natural setting ideal for your group, from family, to youth to active Seniors.